Flying For Home - Unique Racing Sim! 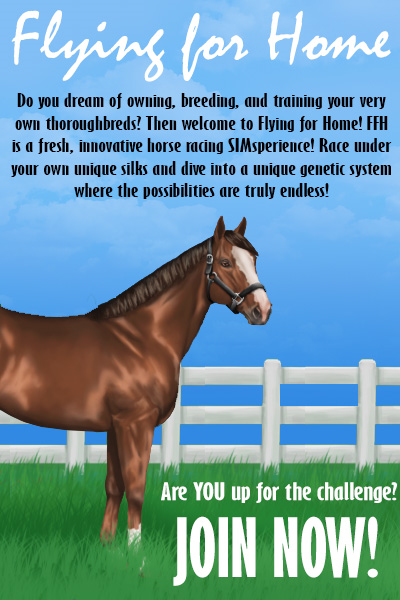 Flying For Home is a strategy based sim game based on breeding and racing your own Thoroughbred horses! There are a ton of realistic based features that influence how each horse races, and the slower game year gives you enough time to plan for the future while still having lots of interesting events always happening. The owners are constantly working on improving and adding new features to the game as well. The Community is very friendly and they love newbies! Drop into the Live Chat any time and there's always people ready to answer questions! We recommend you start by reading the handbook, since that gives you a good overview into gameplay features.